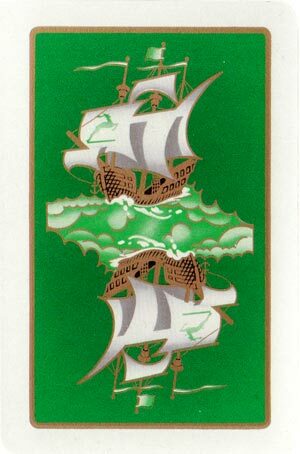 These fanciful designs in Art Nouveau style with oriental flavour were originally created as part of a tarock deck by Argio Orell (1884-1942) as a commission from the Austrian-Lloyd Steamship Line. 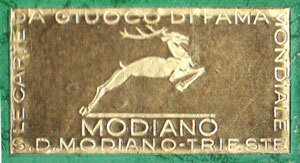 They were first produced in chromolithography by S. D. Modiano in Trieste, Italy, in c.1910. The cut down 52-card version shown here with large indices and titled ‘World Bridge’ has been published by Modiano since around 1950. The tax stamp on the Ace of Diamonds on this copy is dated 1953. The Queen of Spades holds a cigarette, perhaps because Modiano also manufactured cigarette paper. Above: ‘World Bridge’ by Modiano, c.1953. This 52-card deck was originally designed as a tarock deck by Italian artist Argio Orell (1884-1942) as a complimetary deck for passengers of a cruise ship line in 1910. The court cards feature people in richly detailed costumes in the exotic taste of the time in which it was created, representative of four cultures: the Orient for Clubs, Spanish for Spades (with a moorish king), Arabian for Hearts and Egyptian for Diamonds. Persia, India and the entire Asian region to far-eastern Japan are represented as part of Austrian-Lloyd Steamship Line's passenger itinerary. 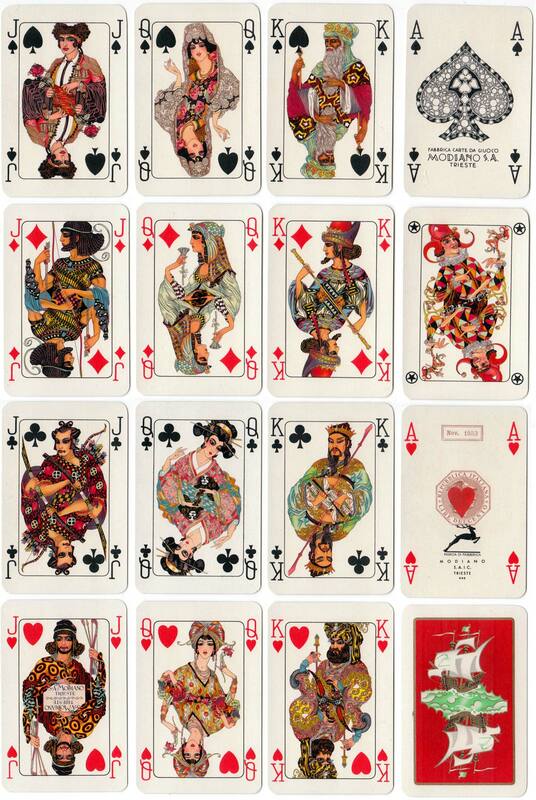 The tarock deck was re-printed in 1981. Images courtesy Rex Pitts.